Source: CICH graphic created using data adapted from Statistics Canada, 2012, Families and Households Highlight Tables. 2011 Census. Statistics Canada Catalogue no. 98-312-XWE2011002. http://www12.statcan.gc.ca/census-recensement/2011/dp-pd/hlt-fst/fam/index-eng.cfm?Lang=E -accessed March 19, 2017. 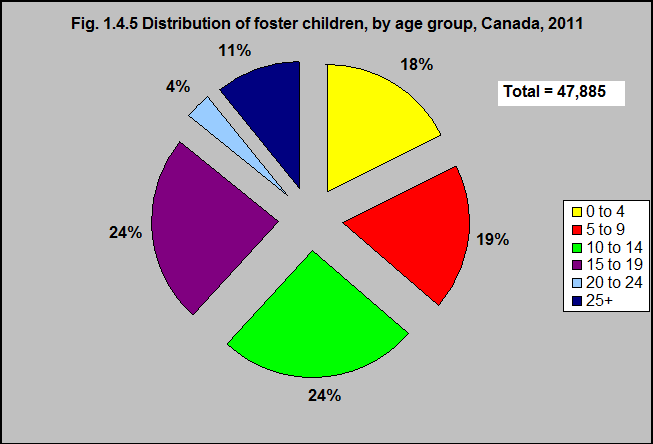 Of the 47,885 children living with foster families in 2011, almost 18% were under 5 years of age.